CoffeeCup Free HTML Editor can help you design and manage websites with a particular focus on an easy-to-use interface with support for dragging and dropping elements. The application has state-of-the-art features, such as SEO, responsive themes, layout maker and code completion. Fortunately, the program has cross-browser compatibility, which means that your pages will look exactly the same independently of the browser you are using to view them. To conclude, CoffeeCup Free HTML Editor is definitely among the best applications of its type. Version 16.1 is a freeware program which does not have restrictions and it's free so it doesn't cost anything. 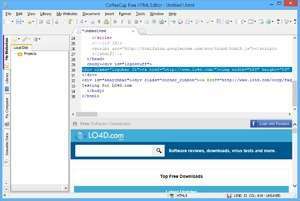 For security reasons, you should also check out the CoffeeCup Free HTML Editor download at LO4D.com which includes virus and malware tests. Additional screenshots of this application download may be available, too. CoffeeCup Free HTML Editor has a presence on social networks.